See guest artist Giles Bettison in a live, narrated demonstration in the Amphitheater Hot Shop on January 29 from 3 to 5 pm. Bettison is well known for his intricate murrine vessels. He has taught at glassmaking schools such as Penland School of Crafts, Pilchuck Glass School, and The Corning Museum of Glass. His work is held in several museum and private collections around the world. These demos are included in the cost of admission (kids and teens 17 and under are free). Giles Bettison received a bachelor's degree from the Canberra School of Art in Australia. He has been the recipient of numerous prizes and awards for his intricate murrine vessels. 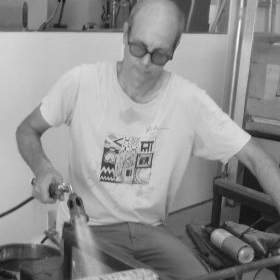 He has taught at schools such as: Penland School of Crafts, Pilchuck Glass School, The Studio of The Corning Museum of Glass, Camberra School of Art,and Creative Glass in Zurich.